This chapter aims to explain seamless learning with regard to motivational issues and ethical usage of technology in the context of a mobile and ubiquitous Technology-Enhanced Learning (TEL). The examined TEL environment consisted of a popular technology integration project in Turkey called FATIH (in English, The Movement to Enhance Opportunities and Improve Technology). The FATIH project aims to provide students with opportunities for self-regulated, mobile, and ubiquitous learning via tablet computers, technology-rich classroom environments, and online digital sources. This chapter investigates and presents findings on the effects of technology-enhanced learning environments in terms of students' motivation and ethical issues during their interaction with the learning environment and community. 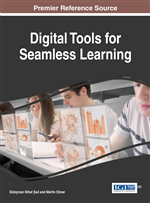 The continuous nature of seamless learning is possible in large part thanks to mobile ubiquitous technologies. Today, mobile technologies are used more and more for educational purposes in all subject areas across all age groups. Most recent research considers mobile technologies as an integral part of ubiquitous learning environments and investigates the ways to connect classroom-based learning with learning elsewhere with these mobile technologies (Sharpless, 2015). Ubiquitous learning environments are settings where students can learn anytime and anywhere (Peng et al., 2009; Wong & Looi, 2011). From a motivational perspective, students can be motivated to study after school thanks to mobile devices like smartphones and tablet computers as a part of ubiquitous learning (Sharples & Pea, 2014). According to the Self-Determination Theory (SDT), two types of motivation are distinguished based on the motivational orientations or reasons (Deci & Ryan, 1985): intrinsic motivation, i.e. “doing something because it is inherently interesting or enjoyable”; and extrinsic motivation, which is “doing something because it leads to a separable outcome” (Ryan & Deci, 2000). While in intrinsic motivation the desire to learn is rooted inside the individual, with extrinsic motivation, the desire to learn comes from outside factors, for example, doing homework because it is required in order to pass a class. This is also related to Moore’s concept of self-motivating learning (Sharples, 2015), in which the learner has an intrinsic desire to continue learning, such that the process of finding something out is its own reward and the learner is motivated to accrete knowledge by exploring his or her immediate ideas and surroundings. In this chapter, the notion of seamless learning across different contexts will be investigated with a special emphasis on students’ motivation and the ethical use regarding tablet PCs issued to students within the framework of FATIH projects.